Folke Bernadotte, grandson of King Oscar II of Sweden, was born in Stockholm on 2nd January, 1895. After graduating from the military school of Karlberg, Bernadotte became a cavalry officer in the Royal Horse Guards. Bernadotte became head of the Severiges Scoutforbund (Swedish Boy Scouts) and during the Second World War he integrated that organization into Sweden's defence system. He also served as vice chairman of the Swedish Red Cross and was responsible for arranging the exchange British and German soldiers during the war. 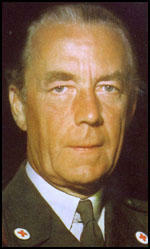 Bernadotte was fluent in six languages and carried out a great deal of important diplomatic work during the war. 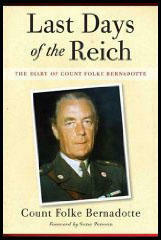 In early 1945 Bernadotte was asked to visit Heinrich Himmler, head of the Gestapo. The two men met in Lubeck on 24th April. Himmler asked Bernadotte to arrange a surrender that would allow Germany to continue fighting the Soviet Union. Bernadotte passed this information onto Winston Churchill and Harry S. Truman but the rejected the idea, insisting on unconditional surrender. On 20th May, 1948, the United Nations Security Council appointed Bernadotte as mediator in the Arab-Jewish conflict in Palestine. After meeting Arab and Jewish leaders he succeeded in obtaining a 30-day truce that began on 11th June. In then developed his own plan for peace. This included the proposal that Israel should relinquish the Negev and Jerusalem to Transjordan. The plan was rejected by both sides and fighting resumed on 8th July, 1948. On 17th September, 1948, Count Folke Bernadotte was assassinated by members of the Stern Group, a Jewish terrorist organization. His book, Instead of Arms, was published posthumously.